Watch two up-tempo, high energy practices filled with drills that you can easily incorporate to your practices. This All-Access video is an inside look into what two time Elite Eight coach Holly Warlick does to make her teams successful. Coach Warlick's style is intense, and her assistant coaches and players reflect that style on the court. Coach Warlick holds her players accountable in order to help them become better players and teammates. You will see how organized, high-intensity practices can help to lead your program to success. This practice focuses on defense and building the culture of high standards and hard work that is Tennessee Volunteers basketball. Players work on half-court defense in addition to various aspects of full court pressure defense. A big chunk of the court time is dedicated to defense, especially in the half court. The Circle Closeout Drill works on closing out on the ball and help defense in a 3-on-3 scenario. The Lady Vols' staff has a scoring system in place to make the drill even more competitive. In the half court, the staff demonstrates how to dig down on the post from the wing guard. This can help disrupt a good post player and get them out of rhythm. In the same segment, the coaches show you how to defend without fouling once the offensive player catches the ball down low. The Lady Vols work on building up their full court pressure with 2-on-2 and 3-on-3 breakdown drills that play up and down. Coach Warlick demonstrates "Fire," which is a full court press that Tennessee goes into after they get an easy basket off of a steal. The second practice focuses on the offensive side of the game with several breakdown drills and multiple segments of controlled scrimmages. The session begins with two different lay-up drills that simulate game-like situations. The first works on driving and finishing in traffic, and the second focuses on absorbing contact from a manager and finishing. 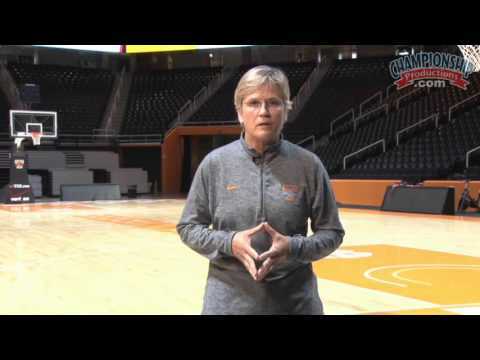 Coach Warlick uses the War Drill for rebounding and to build toughness within her squad. The staff implements offensive rebounding drills where the offensive player is taught to either swim or spin off of the defender. Once a player secures the ball in the drill, they must finish while absorbing contact from a manager with a pad. The Lady Vols work on half court offense vs. both man-to-man and zone. The team specifically works on a ball screen set called Drag. Coach Warlick's club works to attack both a traditional 2-3 zone and a trapping zone. The team also goes up and down in a 5-on-5 scenario. Typically, Coach Warlick uses this time to work on full court pressure and attacking in transition. Coach Warlick and her staff do a fantastic job of teaching individual and team concepts. This video has a wealth of drills that are useable at all age levels and will help to strengthen your team's skills. 118 minutes (2 videos). 2016.